You gotta hand it to this guy, he does love animals. It seems most of his books are focused on the subject, and in this one, he actually creates a world where he can save the animal kingdom from certain extinction via a rocket ship into outer space. Cool, no? It is the tale of Noah's Ark reimagined in a world where the earth's resources have been squandered and destroyed, and in an attempt to save themselves, the animals find Professor Noah and his magical, mystery time machine. Think the Electric Koolaid Acid Test except with animals instead of hippies, a spaceship instead of a school bus and hay instead of LSD. "My friends," said Professor Noah, "it is because of what you tell me that I am building this spaceship. It can fly like a bird, but it will go much faster and very much higher. It can fly to the moon or it can fly to the stars. In fact, it is going to fly to another planet, another world where the forests will be different. But they will be as beautiful as our forest once was before it was spoiled by pollution. Would you like to come with me?" A resounding 'hell yes' is heard and they are off. Two by two and the elephant even gets to don a spacesuit for his own kind of moonwalk. Groovy baby. Instead of traveling through space, they travel through time and end up back on earth before we ruined it with our smog and our cars and our disposable sandwich bags. Ahhh, if it were so easy. Great green message for the space age, plus drop-dead awesome illustrations from one of Britain's masters. 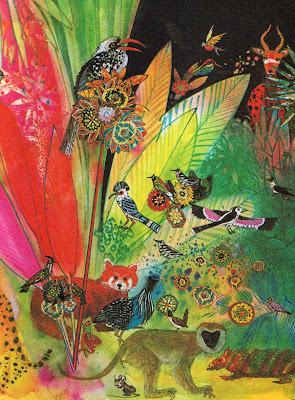 Okay, the story - a little strange, but the artwork is gorgous. At first glance, the top one, looked like needlepoint. Neat. Brian Wildsmith can do no wrong in my book. Once I went to a library booksale and I think they were clearing their whole Brian-Wildsmith-pre-1978 collection and I picked them all up. My son was with me and I believe the volunteer thought those Wildsmith books were for him. Oh, no. 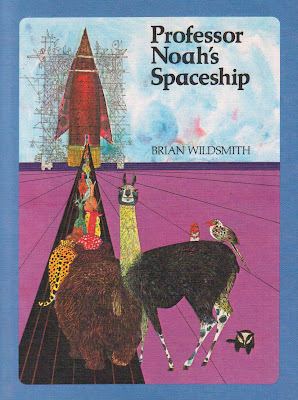 My son likes Brian Wildsmith, don't get me wrong -- but he would have been more excited over lots of Paul Galdone or Maurice Sendak book. oooooh this is stunning - I love his work. Thanks for sharing this. thanks for stopping by my blog. again, another great post! I actually own a copy of this one. Our son's name is Noah and we've been collecting Noah's Ark books. 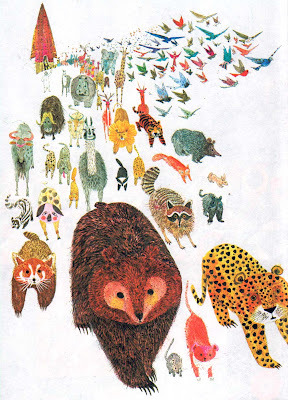 Now, though, I really want a copy of Brian Wildsmith's Wild Animals.